Along time ago the supply chain of companies looked very much like the model below, which is the traditional retail model. In the traditional retail model standardization is the norm, which means that products are mass produced at the manufacturing plant and then sent to the distribution centers. Afterwards the products are distributed to the stores where consumers can purchase them and then consume them. Because the strategy is based on standardization, no distinction is made between consumers and each product that is manufactured has the same design and undergoes the exact same production process and is afterwards distributed to every consumer in the same fashion. For our mini case presentation we chose to compare two well-known companies that are able to activate consumers to create value within the supply chain. The companies we chose were Greetz and Subway. Greetz is a website that allows people to design their very own postcard. It was founded in 2004 and offered consumers an innovative way for sending postcards. When people go to the website they are able to design their postcard in any manner they prefer. It’s even possible to upload your very own image. This is the reason that the Greetz strategy can be considered as pure customization. The customer has complete freedom to design their postcard from the ground up and afterwards have it delivered to a location of their choosing. The second company we looked at was Subway, a very popular sandwich fast food chain that was founded in 1965 in America. At Subway customers are able to choose from a variety of ingredients starting from the type of bread to the flavor of the sauce. Even though the ingredients are mass produced and standard, the customer is able to combine them in such a manner that the end product satisfies their specific individual needs. Because Greetz and Subway use different strategies for delivering products to their customers their supply chains also look different. See models below. In the case of Greetz the consumer goes to the website first to design the postcard. After designing the postcard the consumer pays for the order. Greetz then takes the order and produces the postcard. After the production process has been completed the postcard is delivered to whomever the customer wants it delivered to. This model is a good example of a pure customization strategy, because the consumer has full control over the design and distribution of the product. 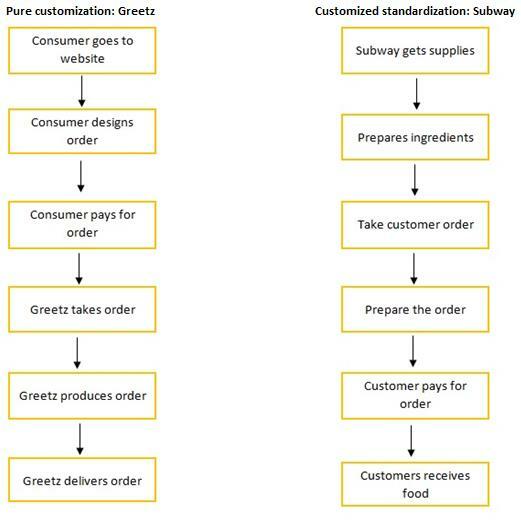 The strategy that Subway uses is customized standardization. Subway allows the consumer to choose from different components so that they can assemble their sandwich in ways that it fits their individual taste. The ingredients are standard and mass produced and every consumer has access to the ingredients, but because they are able to choose and select which ingredient they prefer, they are able to make the sandwich exactly how they like it. Unlike with Greetz, where the company doesn`t manufacture the product until the consumer has made a purchase, Subway will first make sure that the supplies that are needed to make the sandwich are all in place. Here the components of the product are already manufactured, which is one of the major differences between customized standardization and pure customization.